Ravens have a Theory of Mind Say, Scientists, 2018, Acrylic paint on canvas; 90 x 135; 40 x 80; 44 x 54 cm; 55 x 37 cm; 35 x 50 (x2) cm. 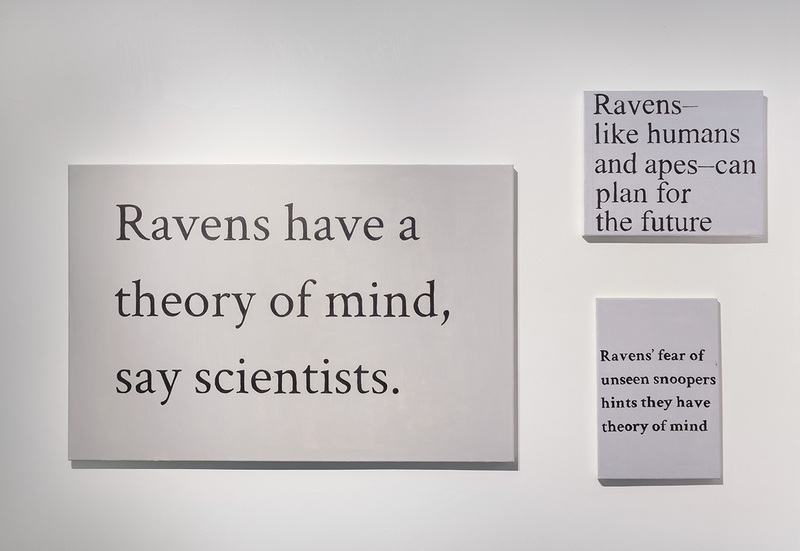 Ravens have a Theory of Mind Say, Scientists, 2018 is a collection of headlines on a specific scientific research on the intellect of corvicea family from various magazines and newspapers including the Guardian, Hackernews and VICE. Human-nature experience is mediated not only by science but also by the media channels that are disseminating edited and altered versions of these scientific researches. In contemporary urban environments we have birds around us but we lack the direct contact and relation with these animals.